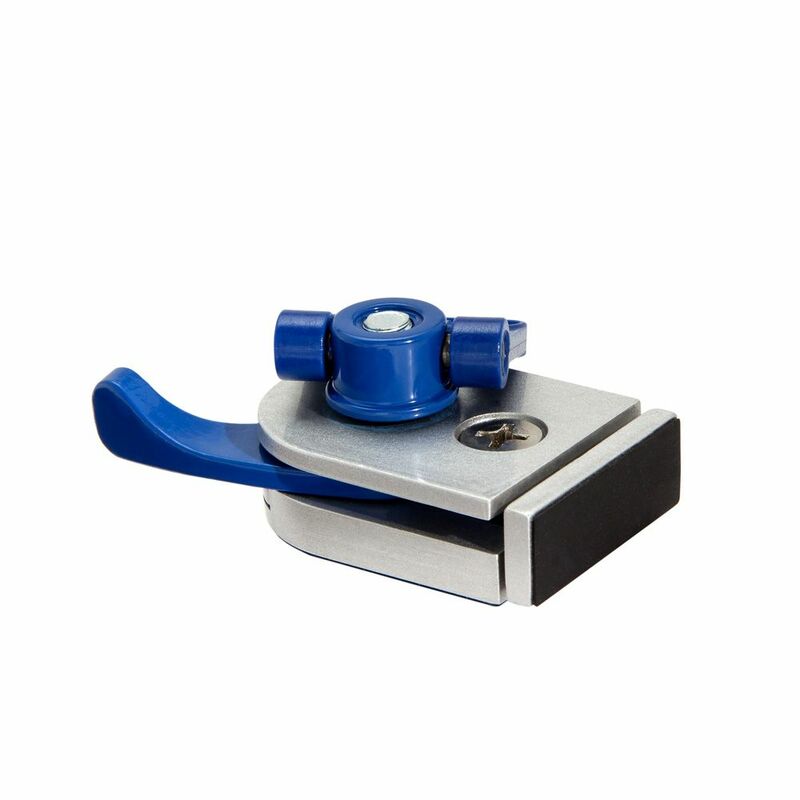 Just slide this mini cam clamp into your T-track and pull the lever to secure your work in position. When paired with a T-track table and one or more of our optional T-Track Stops (#50603, sold separately), this little cam clamp provides just enough pressure to keep your work in place as you machine the unobstructed surface. Thanks to the low profile clamp face (only 5/8'' high), you can easily sand without hitting the clamp. The strip of rubber on the clamp face helps to reduce the chance of marring or slippage. The bottom is also faced with rubber, and features an inline keyed slot that locks into the T-track for further stability. 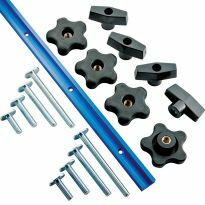 Use with any T-track that accepts 5/16'' T-bolts, including our optional T-Track Table and many CNC tables. 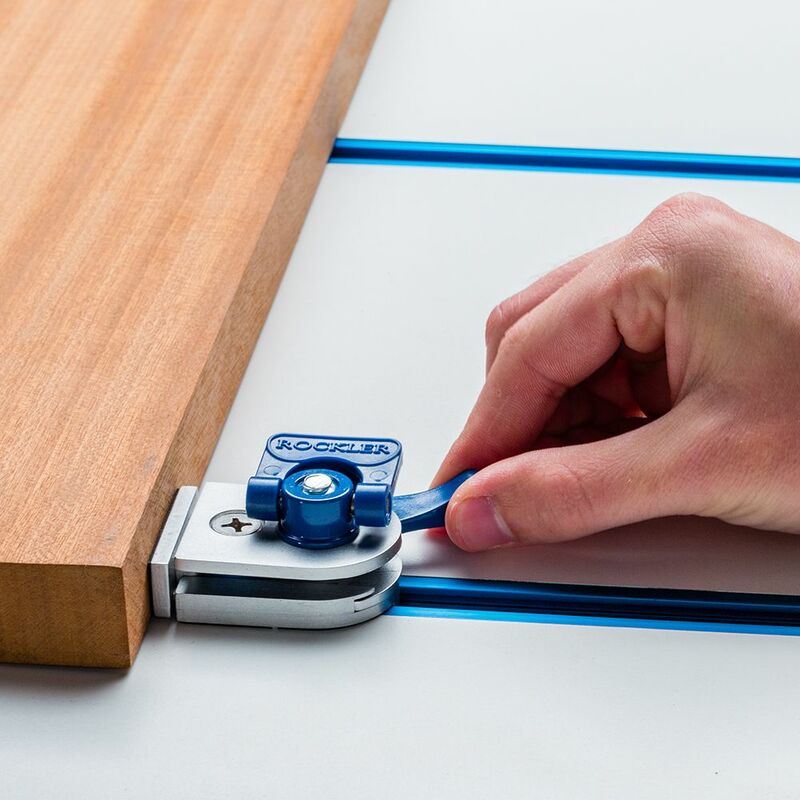 Cam clamps Rock at Rockler. 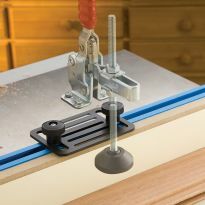 I own 4 of these,there great.I sometimes use a solid stop and cam clamps.I use it on my cnc.And there only 5/8 thick,You could put these on a router Fixture.And not worry your going to wack a clamp.Or for belt sanding. T-Track Cam Clamp . . . Great! These small clamps are low in profile but big on holding. I use them on my CNC and have not had any issues whatsoever. After hitting a few other clamps that were just too tall, these seem to be the perfect item for many clamping situations. I had to grind down the sides of the bolt head that goes into the t-track. It wouldn't fit on 3 different brands of t-track I have used. The spec on the head size is wrong. These are nice additions to a jig table. 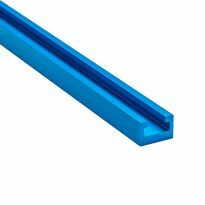 Low profile and nice for CNC machine use. If the design of the base were a little larger and square, you could then rotate the stop 90 degrees and allow it to be used as an adjustable stop or in line. I groused at hubby regarding the Shop Fox clamps and ordered a couple of these to show him how much better they would be. To my dismay, I found that no matter how tight they are in the track, they simply do NOT hold items securely! I've tried to use them as I thought I would like the simple method of tightening them but I've also had to replace one of the screws on the top handle that fell out. To add insult to injury, they also will only work one direction. ShopFox clamps can be rotated to any angle and these cannot. Finally, these are proprietary and without a bit of modification, they DO NOT fit tracks that are not Rockler's. And yes gentlemen, I had to admit my husband's choice was more effective than these pretty blue ones! Limited usefulness since base allows device to sit in only one track direction. In addition the clamp surface has very little travel. I thought these would work nice with my CNC router. I have had them move and let the board lift. On my last project, the screws that hold the thumb knob in place, fell out of one of the clamps and are somewhere in the dust collection system. Hi, our product developers had a couple followup questions they'd like to ask: 1) Did you move the clamp in with the face flat to the body before tightening down the cam? Cam won’t stay locked if it's not applied correctly in this manner. 2) Are you saying it's the t-bolt that holds the thumb knob in place that came loose, or it was the flat head screw that has lock tite on it? As other's have stated. These do not apply any real pressure at all. They slip in track when cam is applied. For my wife to give me for Christmas. looks like it will work well on the CNC table. For use with my CNC work table. New item. Interested in trying. 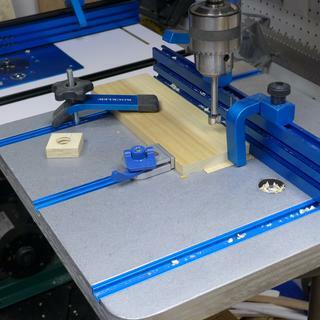 Together with the other items I ordered, I'm building a small box alignment jig for small-sized jewelry box drawers to achieve perfect alignment during glue-up. To with my T top table top. I need something with a low profile on the CNC machine. These cam clamps are low profile. And just what I need to hold down my job on the CNC. Does this clamp also apply downward pressure on the part? Some inline clamps have a tendency to lift the part. BEST ANSWER: This is an excellent clamp and it applies lateral pressure but not downward pressure. I bought most of the t-track clamps that were available on the market and found only one that does that. Shop Fox has a cart iron cam clamp that applies latral and downward pressure . But they are not well cans and have a higher profile. 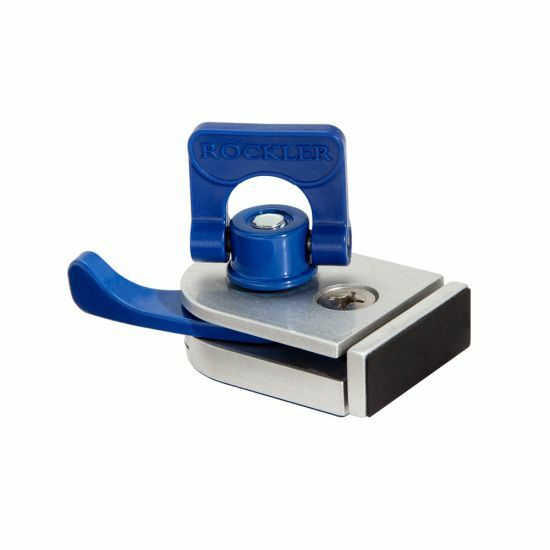 If you don't mind mind two small marks on your wood you can modify the Rockler clamps by drilling the face and putting in the sharp end of two wire nails. 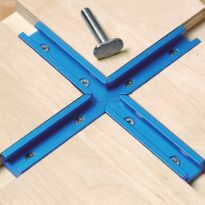 I have modified all of my Rockler clamps in this way to make them useful for CNC clamping were downward pressure is essential. Legacy Woodworking CNC also has a clamp that will do what you are looking for. 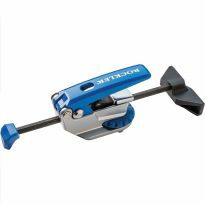 No, but it does have a padded clamp face that allows secure clamping. 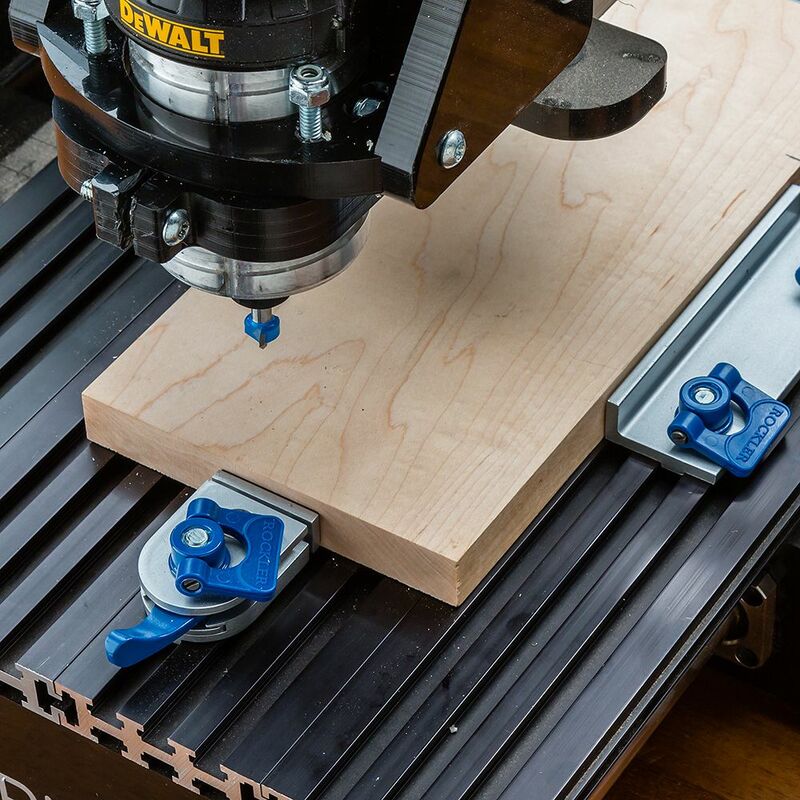 I have had good experience with these clamps on my CNC. However, with that said, there are pads also on the bottom which have slid almost completely off from the clamping force. Maybe I'm just over-tighten. Hi James.I have four of them.I have been using them on my cnc.The clamp's Do not go like a hold down.How ever When you set 4 or 3 push down on your pc.They have been good for me.I have not lost a pc . On my sign table I just installed them and they do exactly what they are designed to do, sideways pressure. I have had no issues with it lifting the part. No downward pressure but no uplift. Just a straight push. Also suggest you undo the screws that hold the handle and put Loctite on them. If you want downward pressure like Mite-bites provide take a look at the new Legacy ones. These are not stops. 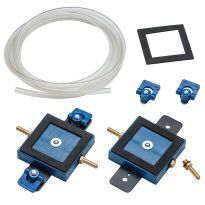 They are, as described in the ads, a cam operated clamp. That's how use them. 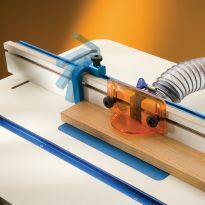 Will this clamp work on a Shop Sabre 23 CNC wood router T-track system? BEST ANSWER: I am not sure if it will work there. While I don't own a CNC machine, the picture appears that the table top is flat with possible t tracks. Check the size of these tracks to see if they meet the specs of the clamp. As far as I know, it is a 1/4" T track that fits a woodpecker hold down clamp which is fastened into the track with a I assume a 1/4" bolt. Kaylan, I just checked the clamp specs and it says this clamp fits in t-tracks that accept 5/16in bolts. 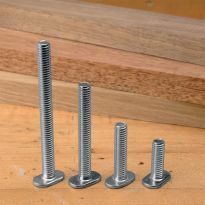 You need to check your table top to see if those tracks also accept the 5/16in T bolts. 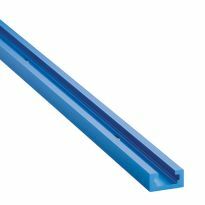 Will this clamp work in 2020 aluminum extrusion rail?